These are just a few of the services for which a Windows Vista client either requires or utilizes primarily DNS name resolution services when accessing. You can discover which DNS server addresses have been assigned to a Windows Vista client by using the option to view status of a connection in the Network and Sharing Center and then selecting the details of that connection. An example was displayed previously in Figure 4.9. Going to the command line and entering ipconfig.exe /all produces the same information. If an issue is discovered within configuration information displayed in the connection details, you can easily attempt a repair by clicking the Diagnose button on the General tab of the Network connection properties. This prompts the use of the Network Diagnostics Framework built into Windows Vista. A solution is given at the end of the diagnosis. A common problem encountered is when application services located on one server are moved or reinstalled on another server. Alternatively, the current server where the application service is located has its IP address configuration modified to accommodate a change in the network topology. When either issue occurs, name resolution problems result as network clients attempt to access that service on the original IP address. One or more issues need to be resolved: An old DNS entry has not been updated on the DNS server, the local DNS cache of the Windows Vista computer, or the DNS cache on the name server that originally resolved the request. Initially, you need to ensure you have reconfigured the DNS Address (A) record on the DNS server housing the DNS zone with the new IP address of the server where the application now exists. To correct the latter caching issues, you need to focus on which is at fault. If the fault is a caching problem on a DNS server that either forwarded the query or performed a recursive lookup, flush the record from the cache on the DNS server. If you suspect the caching issue is local to the DNS client, flush the local DNS cache by going to a command line on the problematic Windows Vista client and typing ipconfig /flushdns. This removes all current DNS cache entries. The Windows Vista resolver service on the local computer is forced to perform a new lookup off one of its configured DNS server addresses. The issue, if local, is easy to determine if other Windows Vista clients on the local network can appropriately access the remote server by name. To view the local DNS cache on a problematic client, type ipconfig /displaydns at the command line. Review the resolved DNS entries within the cache to ensure that the IP address of the server where the application service resides is listed correctly. There are still a handful of times when NetBIOS name resolution is required prior to accessing some legacy service. For instance, NetBIOS name resolution is still needed in some of the legacy Microsoft Exchange application services, in an existing client/server application, or possibly when accessing file and print services that are still using conventional NetBIOS resolution. In any case, there are a few steps that you can take on the Windows Vista client to ensure that the client is configured appropriately or has not held onto a cached entry past its usefulness. Using the display in Figure 4.9, you can see that a single WINS server has been configured for use by a Windows Vista client. By typing the command ipconfig /all, you are also able to view the WINS server entry. a Windows Vista client attempts to use NetBIOS name resolution services first. Be Wary of Name Resolution Services Questions on the Exam I have had some concern with the way questions dealing with name resolution services or command-line utilities for troubleshooting name resolution issues have been handled on past Microsoft exams. There are far more variables that affect whether a NetBIOS service or DNS service resolves a name first than what the preceding net use mapping scenario may lead you to believe. If the name that is to be resolved is an FQDN, assume DNS regardless whether the application appears to be NetBIOS-based. If the name that is to be resolved is a simple hostname, but you know the application is Winsock based, assume DNS is used initially. If the name to be resolved is a simple hostname with fewer than 16 characters, and the application is NetBIOS based (like the preceding net use drive mapping), assume that NetBIOS is probably used first. Finally, if the question is extremely vague as to what type of application it is—in other words, no reference is given to its origin or what clients are accessing it (for example, Windows 9x clients) and all you are given is some generic hostname like “Server1”—go with DNS troubleshooting techniques if given the choice between DNS or NetBIOS utilities. Even these few tenets have issues, but they are the best way to go when these questions appear vague on the exam. When you are troubleshooting NetBIOS issues on a local computer, Nbtstat is the primary NetBIOS name resolution utility. Table 1 shows the different switches you should be concerned with when using Nbtstat to help resolve NetBIOS name resolution problems on a Windows Vista computer. Another useful utility that Microsoft has constantly improved over the years is Netstat.exe. This utility’s primary function is to diagnose TCP/IP network connections. 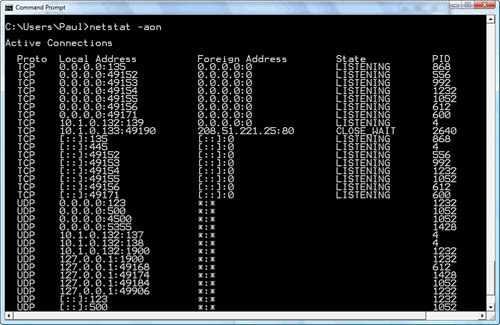 Other useful purposes for Netstat.exe are displaying protocol statistics for IP, UDP, and TCP and displaying the routing table. Table 2 shows the options that are important to the use of Netstat.exe. Several of the options can be used together to align connections with protocols, ports, and IP addresses in use. Figure 5 shows a Netstat.exe display with –a, -o, and –n options. Figure 5. 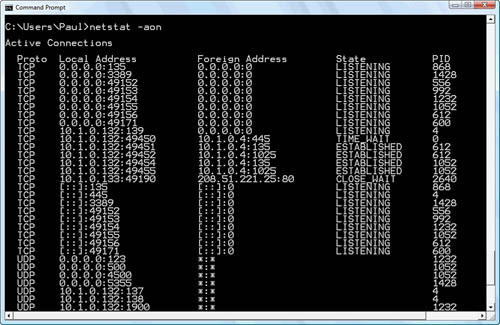 A Netstat.exe display with selected options –aon. Figure 5 shows that this Windows Vista computer is listening on several ports. For example, this computer has an active Server Message Block (SMB) connection with a computer at IP address 10.1.0.4 using local TCP ports 49450, 49451, 49452, 49454, and 49455.  If you were looking at this display, you could also tell that this Windows Vista computer does not have the Remote Desktop Protocol (RDP) enabled for an incoming connection request. After RDP is enabled for incoming requests in the Advanced System properties, Figure 6 shows that an RDP listening port has been enabled. Figure 6. A Netstat.exe display showing that RDP is now listening for a connection. You can see part of the way down the figure that TCP port 3389 for RDP is now set to listen for incoming requests. You can cross-reference this connection with its corresponding Process ID to discover which Windows Vista service is in control of this process. From the display, you see that Process ID 1428 is the index value the Windows Vista computer is using to track this process. 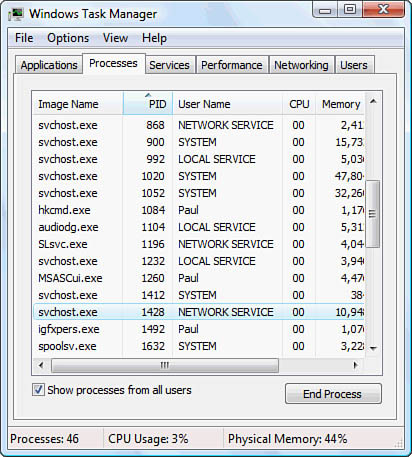 Using the Task Manager application, you are able to see that the system account Network Service owns this process. Figure 7 has this process selected. Figure 7. The Task Manager displaying related processes to previous Netstat output. Windows Task Manager is a fine tool for initial inspection of applications, the resources that they use, the Process ID of the application, the system or user account in use of the process, and several other pieces of valuable information regarding resources of any particular process. A more useful utility would be the Process Explorer tool from Sysinternals. Sysinternals was acquired by Microsoft, but the Microsoft download site still refers to the utility as the Sysinternals Process Explorer utility. It has far more granular information on each process running in your computer. The Process Explorer utility is a good initial starting point for investigating mysterious executables running on your computer. Several older utilities deserve mentioning for troubleshooting network connectivity. The Tracert utility details the path taken from a source to a target computer along with the time difference between the original source each hop along the path to the target. The PathPING utility was introduced in Windows NT 4.0 and combines the functionality of Tracert and PING. PathPING provides the path details similar to Tracert while also providing the end-to-end connectivity between a source and target computer like PING. The necessity for assigning a default gateway address in an environment where the network topology involves routing was discussed previously. To ensure that you have a router that is successfully understood by the local computer, you can check its routing table. 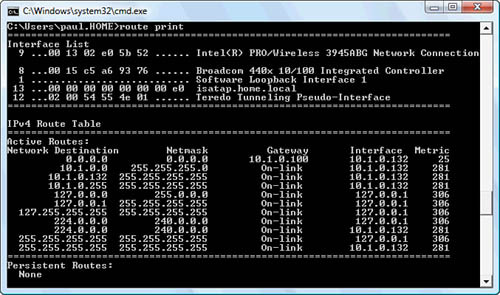 Figure 8 shows the routing table of a Windows Vista host using the route command with the print option from the command line. Figure 8. The route print command displaying the routing table of a Windows Vista computer. The Network Destination column is the column that signifies the remote network for a particular connection, and the Netmask column denotes the Prefix length of the network route. If a remote network destination is not listed in the route table, the route entry with the value 0.0.0.0 and a Netmask value of 0.0.0.0, which refers to any network with any mask, is used. This entry therefore matches any other route not specifically found in the route table. It is also the worst route to any other destination. If any other route entry in the route table had any portion of contiguous bits starting from the high order bits matching the desired network destination, that route would have been chosen instead. Because computer desktops do not usually contain any other route information regarding remote networks in their route table, the default route tends to be the best route, as well as the only route to choose for remote network connectivity.